The announcement of a wide-scale quantitative easing (QE) programme has accentuated the drop in eurozone sovereign bond yields. The interest rate on German 10-year bonds now hovers around 0.21%, or a 23bp drop since QE was officially announced on 22 January. In contrast, credit markets have posted lacklustre performance. The flood of new issues has resulted in some saturation among investors. The volume of issues on the euro IG primary market has hit new highs over the last three months. This renewed activity is linked to the arrival of US issuers attracted by exceptionally low interest rates. Furthermore, extremely low yields limit the potential for spreads to tighten. However, we remain positive about the euro credit market: ECB QE is truly a game-changer for euro bond markets. ECB purchases will bolster demand for credit due to lasting low sovereign interest rates. Furthermore, liquidity injected through this process will certainly contribute to the creation of further bond demand from private investors. It should be clear that the announcement of QE has already had significant consequences for investment flows. The announcement of a wide-scale quantitative easing (QE) programme has accentuated the drop in eurozone sovereign bond yields. The interest rate on German 10-year bonds now hovers around 0.16%, or a 29bp drop since QE was officially announced on 22 January. In contrast, credit markets have not shown any marked trends since that date. How can we explain this muted performance? Furthermore, why do we still think the outlook is good for euro credit markets over the medium term? The HY and IG indexes hit new lows at the end of February before spreads began widening again, ultimately returning to where they were before the ECB announcement. The credit market downturn in March is therefore disappointing, especially compared to the performance of sovereign debt. The 10-year Bund offers an yield of just 0.16 bp when we are writing. 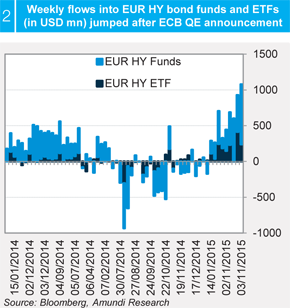 The strong momentum in the primary market: this enthusiasm has negatively impacted cash markets. 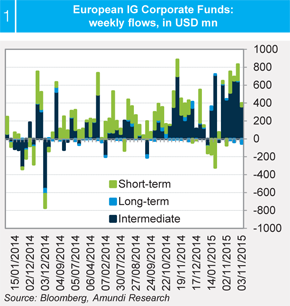 The volume of new IG issues since 1 January totals EUR 120bn, or approximately 30% more than last year. This renewed activity is linked to the arrival of US issuers attracted by exceptionally low interest rates. Companies outside the eurozone therefore account for half of the funds raised in the first months of the year, which is markedly higher than in 2014 (see graph). Another key development is that businesses are favouring financing with maturities of 10 years or more. Increased supply partly explains underperformance at the long end of the yield curve. The primary market is also highly active in the HY segment, with a spate of first time issuers and issuers rated B or lower. Historically low yields: the cost of IG credit is no more than 1%, while HY is at 4%. These extremely low rates limit the potential for spreads to tighten. 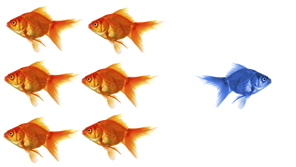 The pace of new issues shows that businesses are eager to take advantage of low financing rates. We expect this trend to continue in 2015. However, we remain positive about the euro credit market. 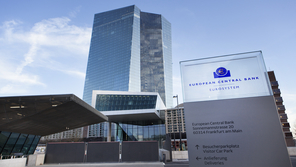 The ECB purchases will bolster demand for credit due to lasting low sovereign interest rates. We expect spreads and yields to tighten in the eurozone. As we already highlighted in the previous Cross Asset publication, ECB QE is going to be a real game changer for Euro fixed income technicals. An additional EUR 60bn of monthly demand for 19 months already represents a remarkable change by itself in the demand-supply balance of the EUR fixed income market. We must not forget that ECB purchases will be carried out in a market whose size is increasing very slowly. 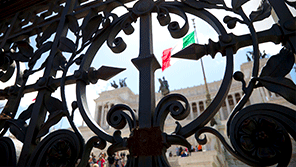 The euro sovereign market’s expansion is being constrained by restrictive budgetary policies. For example, the net supply of long-term sovereign debt was around EUR 200bn in 2014, which is much lower than the EUR 600bn in sovereign debt purchases planned by the ECB. This lack of symmetry affects sovereign interest rates: the percentage of debt assets offering negative yields is growing sharply. This phenomenon is unprecedented in European markets. Furthermore, liquidity injected through this process will certainly contribute to the creation of further bond demand from private investors. Interestingly, in fact, the announcement effect of QE already proved to be remarkable in terms of flows and led to a strong build-up of investors demand for risky assets, ultimately benefitting from the search for yield. These flows help to explain the very positive performance delivered by European asset classes in the first weeks following the ECB announcement, but let’s get into the numbers. The graphs show weekly flows into funds and ETFs dedicated to major European asset classes in the risky assets arena, according to data published by EPFR. Beginning with euro-denominated high rated corporate bonds, namely the IG class, flows show a rebound of inflows especially in funds dedicated to bonds with intermediate maturities. 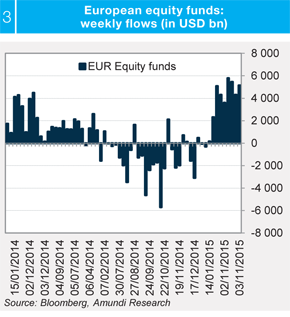 In the seven weeks following the ECB announcement, around EUR 3.3bn fl owed into IG dedicated investors. What the graph shows is the relative stability of remarkable inflows, with an average weekly investment of EUR 470m, vs. an average of EUR 95m in H1 2014 and EUR 255m in H2 2014 (in H2 the market started to reflect the higher probability of ECB QE on the back of the central bank communication). Then a look at the European HY market shows an even stronger rebound and actually an acceleration in demand for this asset class. Both ETFs and funds recorded positive flows and, as we know, the role of institutional investors is stronger in Europe than in the US for this kind of dedicated product. ETFs were more rapid in collecting investments in the very first weeks following QE, but then funds accelerated over the following weeks. Despite the much smaller size of the HY bond market in relation to IG corporate bonds, in fact, funds and ETFs dedicated to speculative grade bonds collected more in absolute terms and precisely EUR 4.4bn over the same seven weeks following Draghi’s move on January 22nd. Another way to measure recent flows is to calculate the cumulated flows on AUM: in just a few weeks the overall outflows suffered in H2 2014 have been completely reversed and these inflows amount to 11% of overall Assets Under Management. These remarkable inflows, contrary to the IG experience, come after a second half in 2014 that showed a stronger impact on outflows than on inflows. H2 outflows were due to volatile phases which saw rising geopolitical risk and spreading deflation fears, but also have to do with the similar and more pronounced trend that US HY investors are experiencing. The spike of recent weeks also looks quite relevant in comparison with the first few months of last year, a phase which saw greater confidence in the Eurozone’s economic prospects. A comparison of investments in European HY bond funds with flows into European equity funds shows a very similar pattern, confirming that the ECB’s announcement has already produced a significant effect in terms of private sector demand for risky assets. Furthermore, in this phase of initial economic recovery, albeit limited in size, credit and equity products are generally still positively correlated. ECB's decisions: what implications for the fixed income markets? The ECB announced on 22 January a massive purchase program (QE) that will last until September 2016 at least (size of €1140 bn should it end at this date).